November 27, 2012 – Alderman Brendan Reilly, representing the Forty-Second Ward, pulls a proposal to build three towers on Wolf Point from the agenda of the Chicago Plan Commission. Reilly says, “Unfortunately, the ‘final’ documents sent to my office yesterday afternoon did not accurately reflect all of the many changes made to the proposal and also introduced a particular blend of uses never previously discussed with my office or community groups.” [Chicago Tribune, November 28, 2012] A major issue concerns hotel rooms, which in the proposal could be as high as 1,800 units. Developers of the ambitious project deny that there will be anywhere near that number of units. A spokesman for the developers also denies that there was an attempt to “blindside” Alderman Reilly. Neighbors, already concerned about traffic and density in an already crowded area, began contacting Reilly’s office upon learning of the 1,800 hotel rooms. The developers, which include Christopher Kennedy, whose grandfather bought the site in the 1940’s, state that the figure of 1,800 refers only to the number of units that could be built under current zoning regulations. It all worked out. 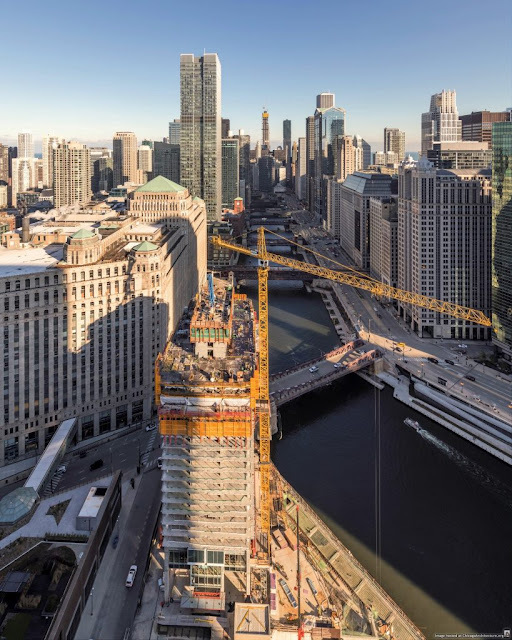 The second tower on the site, Wolf Point East (shown above), is nearing the halfway point in its climb. November 27, 1954 – The extension of Lake Shore Drive from Bryn Mawr Avenue to Hollywood is opened to traffic as representatives of four government levels join in the ribbon cutting ceremony. Chicago Mayor Martin H. Kennelly who calls the new road “a monument to co-operative enterprise.” [Chicago Tribune, November 28, 1954] is joined by representatives of Cook County, Illinois and the Chicago Park District as a hundred onlookers “shivered from a cold wet wind off the lake.” A Cook County commissioner, Arthur Elrod, says that he hopes one day “to attend such a ceremony opening a lake front drive as far north as the Wisconsin line.” When the barricades are removed at noon, motorists take one of three choices as they continue north. They can head west on Foster toward the south end of the new Edens Expressway. They can turn onto Bryn Mawr and head for Peterson Avenue and Ridge Avenue. Or they can continue north to Hollywood and Sheridan Road, heading through Rogers Park and Evanston. The choices are pretty much the same today, over sixty years later. The top photo shows the area north of Foster Avenue in the late 1930's. 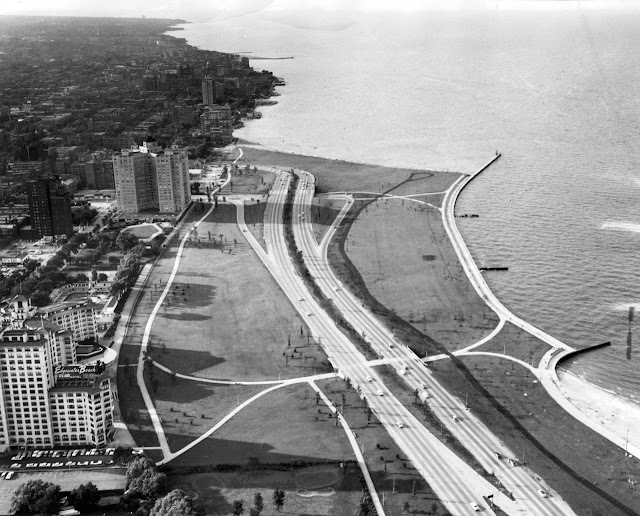 The photo below that shows the same area 20 years later after the Lake Shore Drive extension opened. 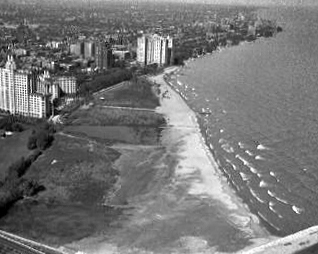 Easily seen is that the new road was not good news to the owners of the Edgewater Beach Hotel, the building in the foreground of each picture. November 27, 1953 – Colonel Frank F. Miter, Commander of the 45th AAA brigade, a battery of 120-millimeter anti-aircraft guns, announces that the battery will be moved from its site at the north end of Meigs Field to a “safer Chicago park district site.” [Chicago Daily Tribune, November 28, 1953] The site, in the direct path of planes landing and taking off, was never terribly appropriate, but a realignment of the entire air defense structure of the city made it possible to initiate the move. There was more than that, though. It was becoming apparent that the guns were out of step with the next generation of air defense. 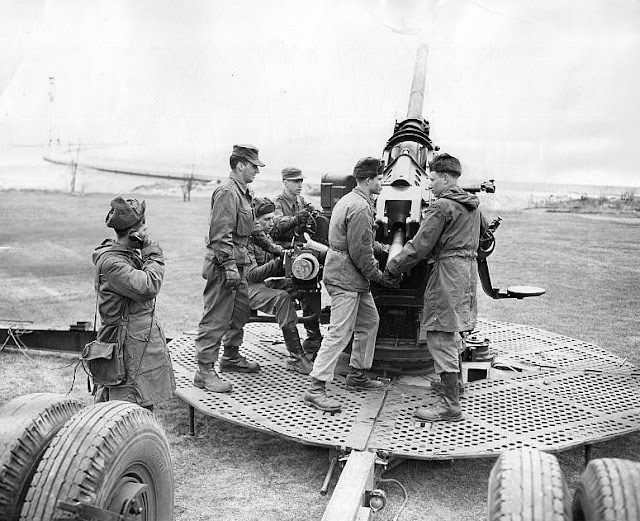 According to the Tribune article, “Actually the transfer, it was learned was fitted into a large realignment of Chicago’s ground defense facilities. The new AAA pattern, it was reliably reported, will include sites for the location of batteries of missile men trained in firing the army’s new Nike guided missile [rocket] which is reported to be more accurate and have a longer range than the big 120 mm. guns.” The photo above, although taken at Montrose Harbor, shows the guns that protected the city as the Cold War began to heat up.